With the upcoming graduations in June, May felt very much like it was waiting for the ball to drop. Yes, anticipation is building for the next round of releases from Hello! Project. But, first things first: let’s give ℃-ute their well-deserved spotlight. Can you feel that? The Summer Wind, the winds of change are blowing. By the time you read this ℃-ute will be no more, but before we can report on the final days of ℃-ute we need to talk about their month of May. The ℃-ute wrap up started early in the month with the release of the group’s “℃-ute Last Official Book”. Filled with last gravure photos, solo projects, two-shot dialogues, solo interviews, and round-table talks, the book sounds like it would be welcome on any ℃-ute wota’s shelf [amazon] [cdjapan] [yesasia]. The next summative release for the group was the group’s “℃OMPLETE SINGLE COLLECTION”. If you go “whole hog” on this release, you treated yourself to every single release, every coupling track, a disc worth of rare tracks, a Blu-Ray of ℃-ute Special Live 2017 ~℃ocktail in ℃OTTON CLUB~ (2017/2/9 Recording), and a Blu-Ray of the group’s Music Video Clips. That mountain of material spread itself among three different editions of the release. Happy retail day [amazon] [cdjapan] [yesasia]. With these two releases, the continuation of the group’s final tour, and the last hurrah of television spots for the group, it’s not any wonder the group is on top of the Projects for its final full month. I’m sure you know what to expect next month when the girls play their final concert at Saitama Super Arena. I know last month’s Power Rankings didn’t have enough time to let it sink in, but Kudo Haruka is graduating at the end of the Morning Musume ’17 fall tour. Do you remember those years when Duu was the youngest member (ever) in Morning Musume and the youngest active member of Hello! Project? The youngest is graduating ahead of her seniors to become an actress, and that is significant. Maybe as a lead up to her graduation, and maybe to give the wota what they always wanted, Kudo Haruka and Sato Masaki released a MaaDuu single: “Miss Henkan!!”. The digital release featured artwork from Country Girls member Yamaki Risa and can be had at iTunes and Recochoku. In other news, Makino Maria landed the cover of Young Magazine 2017 no. 24. I suppose there’s less and less to say about that since Maria seems to be getting a lot of regular work. It’s summertime, so you know what to expect (bikinis). Keeping with the Ham Fighters fan, Maria also threw the first pitch at ZOZO Marine Stadium in Chiba on May 30 as part of Morning Musume ’17’s tenure as official cheerleaders/support ambassadors during an “Interleague” (Central League vs. Pacific League) tournament. To close things, Morning Musume ’17 stopped by Nippon Budokan for a performance of their “2017 Haru ~THE INSPIRATION!~” tour. Confusingly, the tour won’t wrap up until the next performance on June 23rd, again at Budokan … and then makes another (make-up) stop at Okayama on August 13. Why the delay? The girls are performing in their summer musical “Pharaoh no Haka” for the most of the first two weeks in June … which will definitely be reported here. Big news hit us on May 12 when Fujii Rio announced her graduation from the group and from Hello! Project (see article). The news blindsided practically everyone. The Kobushi Factory sub-leader set September 2 as her final date in the Projects during the Hello! Project Summer Concert “HELLO! MEETING HIROSHIMA” in … Hiroshima. The graduation holds special significance since Riorio will be the first girl to graduate from the Factory groups. In other news, the Kobushi Factory girls spent most of their time on the road during the month performing the bulk of their “Kobushi Factory Live Tour 2017 Haru ~PROGRESSIVE~” dates. As such, the group didn’t make many other media appearances beyond their weekly UTANAVI spots. But, one fun clip that did emerge was the trailer for the upcoming “JK Ninja Girls” movie as well as the Kobushi Factory promotional video for “Eejanaika Ninjanaika“. Both of these clips show us that Nomura Minami has the best fidget spinner, no contest. With all the speculation and anticipation hovering around Juice=Juice and their upcoming World Tour, you might expect at least a shred of news, you would expect some news about the group’s globe-trotting ways. But actually, nothing materialized during May. Tickets for Mexico City went on sale, but that’s it (spoiler: European tickets on sale now, details here). So, what kept Juice=Juice from the basement this month? To begin with, the group’s latest single “Jidanda Dance / Feel! Kanjiru yo” finished its release week with a number 3 ranking and 32, 788 units in sales. This slight bump over their last previous release tells us that the group hasn’t settled into anything, yet! In fact, with the Oricon counting change, there’s a strong possibility the group actually still around the same sales amount as their Oricon high mark of 41, 745 (“Next is you! / Karada Dake ga Otona ni Nattan ja nai”). Keeping with release news, mid-month the group released their first digital single “Goal ~Ashita wa Acchi da yo~” [iTunes] [Recochoku]. The song has been a part of Juice=Juice’s setlist since about October last year, so now we finally get a release of the song using the latest method of deployment for Hello! Project. Finally, Miyamoto Karin made a move back to the print realm with a cover and gravure pages in Weekly Shounen Champion no. 25. You know where my tastes lie; I hope this appearance signals the coming of her fourth photobook! Decidedly less news comes from the ANGERME camp these days. May brought the anticipation of the new single, but not much actual news of the 23rd single. But, there were at least two items from the month that helped keep Wada Ayaka and company afloat. On the softer side of the news, the Murota Mizuki photobook “MURO” finally hit the shelves mid-month after what feels like months of teasing by Murotan herself. And then, well OF COURSE, ANGERME sold out their performance at Nippon Budokan on May 15. Whether or not the group would sell out their show concerned a great many HaroWota, but in the end all the tickets were sold. 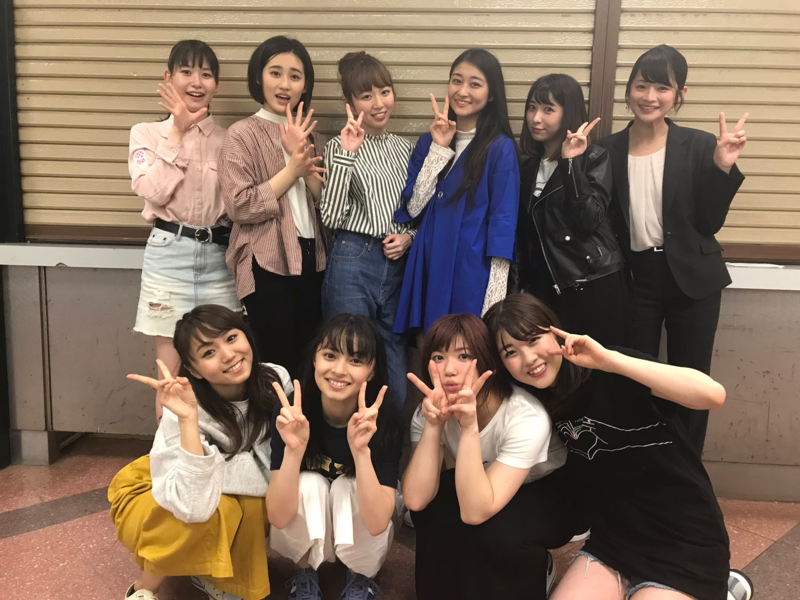 As a special treat for you, the concert also held a backstage mini-reunion of ¾ of the original S/milage when both Fukuda Kanon and Maeda Yuuka visited their former group. Up ahead, June will be a busy month for the group with the release of the triple A-side “Ai Sae Areba Nanni mo Iranai / Namida Iro no Ketsui / Majokko Megu-chan” on June 21st. Look for the ANGERME ascension! Rounding out the middle floors of the Projects, Country Girls kept themselves busy in May with their “2017 Haru ~Momochi-ism~” tour. The big news, and the news that will no doubt dominate the group’s fortunes next month, is the upcoming graduation of Tsugunaga Momoko. Early in the month, the “Tsugunaga Momoko Idol 15 Shuunen Kinen Album ♡Arigatou Otomomochi♡” was announced for release on June 21 (subsequently rescheduled for June 28). The sprawling 3 disc set will include solo cover versions, unreleased Country Girls songs, and a “fan choice” disc. For Country Girls fans, the disc is a must-have for those unreleased tracks. Speaking of releases, the Yanagawa Nanami / Funaki Musubu ~Greeting~ Blu-ray Disc finally went out to the people in May (to answer your question- mine hasn’t been shipped yet). Which leads us into June, which will see the release of the YanaFuna ~Greeting~ Photobook, the Morito Chisaki “Chisaki in Paradise” ([amz] [cdj] [ya] solo image Blu-ray, and the Momochi triple-album before ending with the Country Girls down one member and playing manager. I’ll try to keep it together. Welcome to the basement of the Projects. This is the second straight month Tsubaki Factory have been down here, and I feel bad about that. But, they are a new group who still need to find their legs in the idol scene. Fortunately, the group took a big step forward with their performance at @JAM 2017 this month. Along those same lines, the group perform at GIRLS IDOL FESTA 2017 mid-June along with other up-and-coming idol groups. I think the GIRLS IDOL FESTA performance will be a great look at how the latest Hello! Project group stacks up against the competition. Tsubaki Factory also celebrated the release of the soundtrack to their musical “Nega Poji Poji” which looks at the lives of the daughters of a rice cracker shop in Tokyo. With the sparse schedule the girls have in the next month, perhaps they’ll need to take “Just Try!” to heart a bit longer. Like always, you are free to disagree. In fact, please disagree! That will give us something to talk about! You can give me an earful in the comments below, my personal twitter, or the New School Kaidan Twitter. Don’t forget to visit my blog at TheNumber244 where Fukumura Mizuki is always relevant. Until next time!